You bought that wig to help you get through chemotherapy, but now you’re done and your hair is growing back. What should you do with your second set of locks? If you have a wig just sitting around, you have a lot of options. First, if you know someone who may need it, you can send it directly to them. Some of the message boards on cancer communication sites (like cancer compass) have places where you can advertise your old wig for cancer fighters who would like a wig, but can’t afford a new one. If you don’t make a direct connection with someone, there are several other options. Here are just a few. Whatever you do, don’t just let that head of hair sit and gather dust! • Oncology offices like cancer centers, will often take used wigs. Call your local oncology centers. • Cancer support groups often know where you can take used wigs. If you took part in a support group during your treatment, contact them for information on where you may donate your wig. • Wig shops often make a habit of donating wigs to cancer patients. Yours could become one of those passed on to someone who needs one. Beautiful Naturally Wigs and Hair Pieces is one such shop that takes donations of gently used wigs. 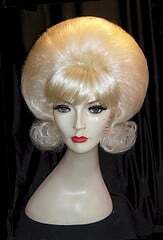 Or try WigShop.com-they have a list of locations where you can mail used wigs. • The American Cancer Society (ACS) has many local chapters that provide free wigs to cancer patients and take wig donations. • CancerCare has offices throughout the nation and would be happy to take your wig donation. • University of Michigan Health Center maintains a large collection of donated wigs. Check other health centers in your area as well. • City wig drives may be occurring in your area. Watch the news and take your wig to the drop-off sites. Have you donated your wig? How did you do it? Please share your story. Photo courtesy A K Wig Designs via Flickr.com. I have a few wigs I used during my chemo treatment that I don’t need anymore and I like to donate them. Can you give me info on how to do that? Absolutely! As mentioned in this post, check with your local wig shops, hospitals, and cancer centers first. Tell them you have the wig and you’d like to donate it—I’m sure they will help guide you as to where to drop it off. You can also check out this website from the American Cancer Society—check it out at: http://americancancersociety.thegivingeffect.com/. Fill out this online form and they will get back to you on picking up your wig. Don’t forget the other options mentioned in this post, including online wig shops. Thanks for helping someone who is newly diagnosed! Clayton, that’s awesome! I love hearing stories of people giving back like you’re doing. And I’m happy for you that your hair came back, so that now you can share it with those who need it. Thanks for spreading the light! NJ and during breast cancer awareness month I am running a fund raiser and with the proceeds I would like to arrange for wigs for women with breast cancer. Anyone who can help me or give me direction on where to go and who to contact it would be greatly appreciate.